Dubna is the longest river of Latgale. It begins and ends in Latgale. 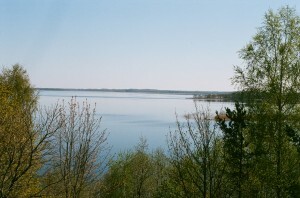 The river Dubna streams out of the lake Sivers, the ninth largest lake in Latvia. 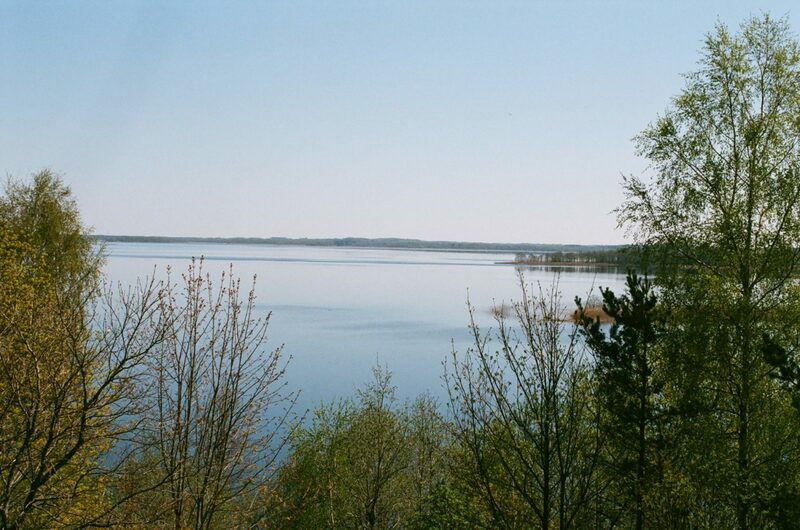 Although in some materials the lake Cārmins is considered to be the source of the river Dubna, but we support the opinion that Dubna streams out of the lake Sivers. 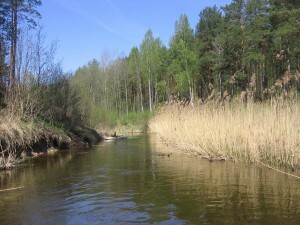 Also the local inhabitants call the nullah connecting the lakes Sivers with Ārdavs and Ārdavs (Ploteņu) with Lejas ezers as the river Dubna. Dubna is the right affluent of middle reaches of the river Daugava and it is the second longest affluent of the river Daugava in the territory of Latvia. Longer is only the river Ogre -188 km. Length of Dubna is 120 km, slope is 76 m, area of basin is 2780 km2, the average flow rate in the entry: annually 16,7 cumecs, during high water 112 cumecs. For tourism it can be used all the season from the lake Višķi, but in low water level it could be problematic to move from the source to entry in the lake Višķi. In the upper course to the lake Višķi you have to count with frequent obstacles of fallen trees and spans with low water. The way is obstructed also by the small hydroelectric power stations that are four within this span, two mill sluices and one embankment. In the upper course when flowing through the Highlands of Latgale, Dubna is rapid, riffles interchange there with slower spans. Although more to be more precise it must be said that is was rapid because after 2000 the most beautiful and rapid spans of the river were deluged when building the small hydroelectric power stations. Before they were built water mill ruins and remains from sluices had survived here in place of what the mentioned hydroelectric power stations were built. Here, in the not deluged spans of river, its width reaches ca. 10-15 m.
Behind the lakes Višķi and Lukna the river Dubna flows through the plain Jersika. Here the river grows wider and deeper. The width reaches 15-20 m. Here the riverside is low so the meadows and arable land adjacent to the river was flooded in springs. 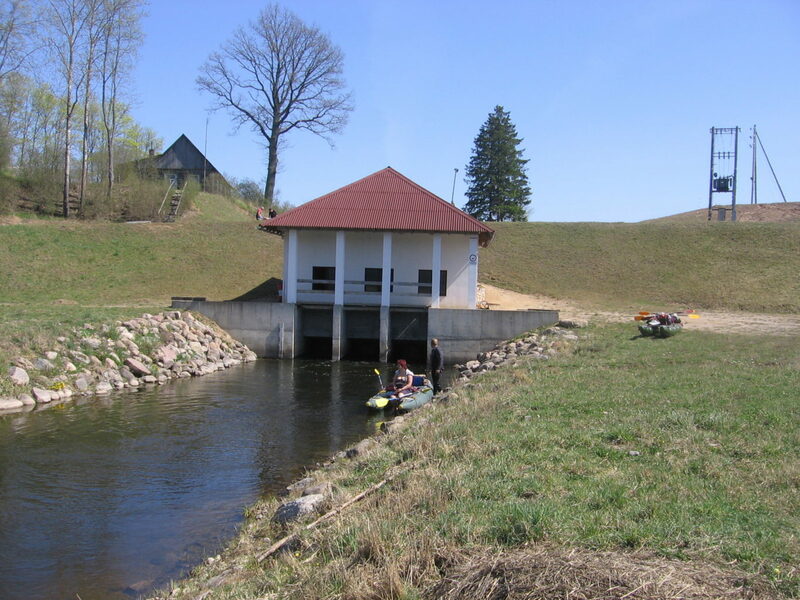 Already in the thirtieth the government of Latvia financed one of the greatest that time land amelioration measures and controlled the span of the river in the length of 61,6 km. During the Soviet times a 614 ha big polder with pump station and 2.3 km long protecting dike was built in Pelēči parish. It must be mentioned that currently the area of polder begins to overgrow with shrubs and the draining systems begin to crash. In the result of ameliorative measures there are many dead arms of the river on the sides of Dubna, particularly in the span from Špoģi – Preiļi road bridge to Arendole and Vecvārkava (Upmala). The biggest right-side affluent are Feimanka, Oša, Jaša, Šusta, Divkle and Egļupe, but on the left-side -Kalupe, Malnaviņa, Kucupe and Bērzupe. The right-side affluent are much longer than the ones of the left-side because the left-side river flow directly in the river Daugava. The longest right-side affluent Feimanka (72 km) is more then two times as long as the longest left-side affluent Kalupe (32 km). In the upper course Dubna frequently flows through a wood. The biggest wood area that is crossed by Dubna in this span is from Staškeviči to Lauku Ļāperi. The surroundings of Dubna in whole span from Špoģi to Līvāni can be agriculturally used and wood areas aren’t directly adjacent to its sides. Usually the sides are overgrown with shrubs – osiers, willows, alders, bird-cherry trees, etc. Just in Arendole the beautiful Arendole estate park with centenarian trees is adjacent to the very river. Behind the Rožupe the river Dubna grows wider and the width thereof reaches on average 20-25 m. It is connected with the fact that two biggest affluent- Oša and Feimanka flow into the river Dubna in a short span. At Rožupe there is hydropost where the hydrographical measurements are made. Since in summers the river Dubna badly overgrows, particularly behind Rožupe, then in 2009 this span of river was deepened. The aim of deepening was to facilitate more rapid water flow rate expecting that it shall decrease the overgrowing of the river with waterweeds. Before Līvāni several small islands appear in the river Dubna where in springs ice jams form. In Līvāni in 2001 the Straumes HPP was renewed. Behind the HPP, before the entry in Daugava the river Dubna forms a quite branched delta that sharply turns from west northwards. Further more detailed description of the route of upper course of the river Dubna. We begin the route at effluent of the river Dubna from the lake Sivers. To get there we have to go to Kombuļi and then turn on the Kombuļi-Auleja road and ca. after 7 km we shall cross the bridge over Dubna. On the first turn after the bridge at the road with the sign to Vanagi we turn right and after 1,5 km we turn again right and arrive at the margin of the lake. The mound on the left side is Brāslava castle mound. Getting at the margin of the lake should be agreed with the landowner from the nearby house. Before getting into boats we must definitely go onto the Brāslava castle mound. From the top of the castle mound we can see fantastic panoramas on the lake Sivers and the Highlands of Latgale. On the top of the castle mound the local inhabitants celebrate Midsummer Day and here is the place for Ligo bonfire. Now we can begin our route. By the river Dubna we go to the lake Ārdavs. Arriving in the lake Ārdavs along the right margin we go westwards to the overgrown lake Ploteņš. Here the opinion of cartographers and geographers differ–whether Ploteņš is a separate lake or just a creek of the lake Ārdavs? 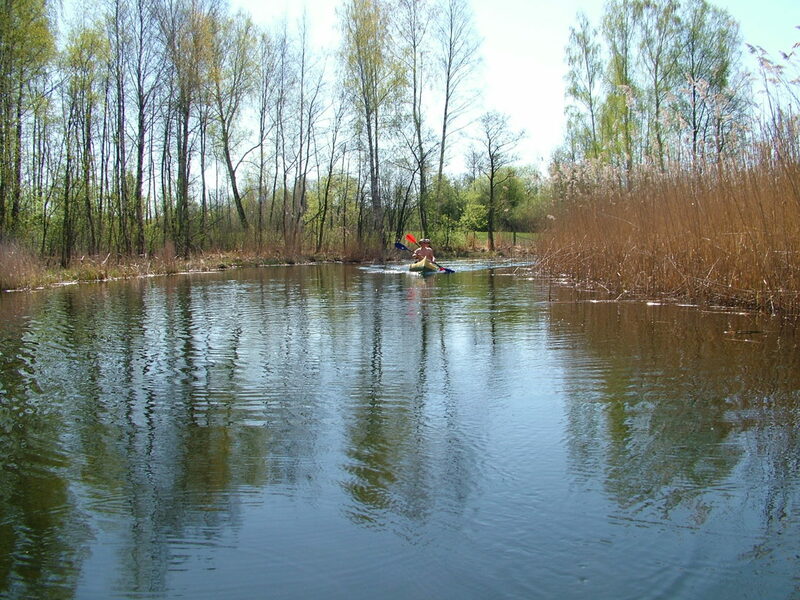 However it may be, in the latest cartography materials Ploteņš appear and we shall regard it as a separate lake, although when entering it we shall see that all around there are only reed and water-plants among that there is a few metres wide free water zone that in 800 m grows into the river Dubna. Having gone another ca. 450 m we arrive at Kombuļi-Auleja road bridge. Totally in the route we have covered 3,7 km. Behind the bridge we have to make another 750 m by the river Dubna and then we arrive at the lake Lejs. At the entry of Dubna in the lake there is a nice resting-place that is managed by the owners of 350 m distant guest house “Lejasmalas”. Lejs or the lake Lejas is located in winding subglacial shallows between the lakes Ārdavs and Cārminis. The lake bed has a wide south part (arriving into the lake from the river Dubna it remains on the left from us) and a wedge-formed bottleneck on the north-west (in this direction we must continue the route). The lake has three depths – 30,7 m in the south part, 34 m opposite the eastern bank, it is the deepest place of the lake, and 15 m at the south-east end. 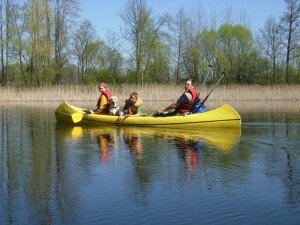 The average depth is 8,2 m. Lejs is the tenth deepest lake in Latvia. The area of the lake is 177 ha, together with the islands – 178 ha. In the place where the widest south part of the lake gets into the narrower north-west part there are two islands that can be went round by the east or west side. We continue the route north-westwards – the lake becomes narrower and narrower till at the end of the reck we arrive at the source of the river Dubna and entry in the lake Cārmins. Here is also a bridge. In the route we have covered 6,1 km. Cārmins (Cārmans) is the next lake in our route. Its area is 222 ha, together with the only island 224 ha. The length of the lake reaches 5,6 km, but the width 0,6 km. The average depth is 9,3 m, but maximum depth – 30,6 m. Cārmins is one of the picturesque deep and large lakes in the undulating ground of Dagda. The lake is of subglacial origin, the shallows bent north-westwards and south-eastwards. The banks are sheer and overgrown so particularly beautiful landscapes can be seen in spring and nice autumn days. The lake has many creeks and recks. The deepest part of the lake is in the north part. Immediately after the two only islands of the lake on the left side the river Dubna sluices. In some materials it is said that this is the real source of the river Dubna, but as it frequently happens, opinions about the sources of rivers differ. 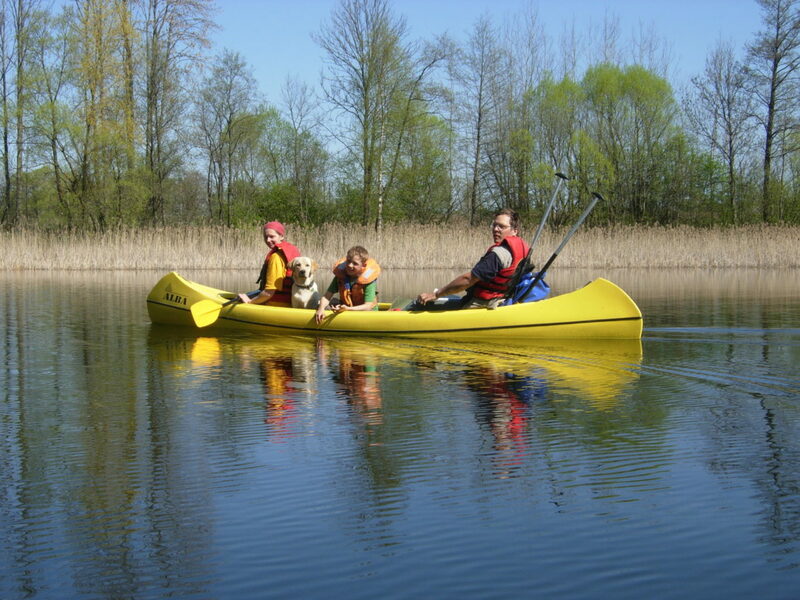 To protect the beautiful landscapes and frogbit family plants, in 2004 Cārmaņa lake country park was established on the banks of the lake Cārmins with the area of 529 ha. When entering the lake Cārmins we go initially along the left margin westwards. Gradually the route turns northwards. Ahead we can see two islands behind that there is the mentioned source of the river Dubna. After 1,7 km we reach the source of Dubna. The source has hid in shrubs opposite the smallest island that is located more on the north. After 450 m we reach delta creek of the lake Zosns that in summer usually overgrows. After another 400 m we go into the lake Zosns. The are of the lake Zosns is 18 ha, the average depth 2,0 m, but maximum depth reaches 3,0 m. Here we keep at the left margin because the source of Dubna is on the west of the lake. After short 0,6 km we arrive at remains of a bridge. Once here was a pedestrian bridge but now only separate wooden poles are left over that there has been a footbridge. During low water this place is used as a ford. The riverbed here is comparatively wide in places more than 30 m, but it is overgrown with reed and other water-plants. Behind the remains of the bridge after 500 m three culverts are placed in the river and dike is made over them over that gravel is taken from the pit that we can see on the left bank. The gravel-pit was created in 2010. Here we’ll have to pull the boats over the dike. Soon after the dike the river comes closer to the Krāslava-Aglona motorway. In this place the river sharply turns southwards and continues to flow parallel to the motorway. After 1,0 km we reach Sakova mill-lake and the bridge over the dike connecting Aizupes with Krāslava-Aglona motorway. Also here we’ll have to carry the boats over the dike. After 0,3 km we reach the bridge of the motorway over the river Dubna. Totally in the route we have covered 9,4 km. Behind the bridge after 290 m we float in the lake Sakova. 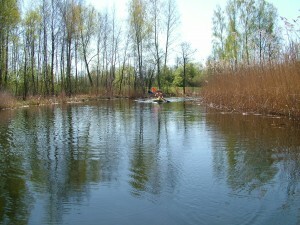 Area of the lake Sakova is 22 ha, the average depth is 1,8 m, but maximum depth 2,0m. In the lake Sakova we keep closer to the north margin because the source of Dubna is located in the north-west part of the lake in the place where close to the margin houses can be seen. About the middle of the lake on the left from us we can see the only island of the lake. When further traversing the lake the river Dubna mainly cranks through a wood till after 2,3 km we reach Kovaļova millpond. By the flux we go another 260 m and reach the mill dike. Here we’ll have to carry the boats. When going ashore ca. after 150 metres we can see the blue-green Kovaļova old-believer preaching-house. At the same time we can go to see it. The chapel was built in 1861. Here it is possible to order an excursion with narration about traditions of old-believers and icon-painting but during the visit you must observe the custom of old-believers-women must wear a kerchief and long skirts, men – long trousers. Excursions can be ordered by the phone 65646278. Having seen the chapel we board and continue the route. Although in straight direction there are ca. 300 m to the Šķeltova-Grāveri road bridge, by the river the distance reaches almost one kilometre-980 m. At this bridge we have covered 13,3 km in the route. Further for 3 km the river Dubna snakes through meadows overgrown with shrubs in parallel to Šķeltova-Grāveri road. The average distance from the river to the road is 150-350 m. After 3 km the river discharges into the lake Aksenova. The lake Aksenova with its six islands is one of the most picturesque small lakes in our tour. In some materials a fact appears that there are seven islands in the lake. Some day perhaps it was so, but the biggest island has merged with the smaller island on the north and now it is practically one island. Area of the lake Aksenova (Aksjonova, Aņisimova, Savičs) is 1,25 km2, together with the island 1,32 km2. The average depth is 3,5 m, maximum depth 9,4 m. In the north banks are low, in the south-sheer and picturesque. Length of coastline reaches 5,5 km. Area of the biggest island is 5,1 ha. Lake bed in the south-west part 7-9,4 m deep, coastline sandy, in greater depth there is mud. We have to keep in the middle of the islands to find the source of the river Dubna from the lake. We must look for the source of the river Dubna opposite the second island on the left side. Over the lake we must have covered 1,55 km and after another 300 m we reach the Grāveri-Aksenova-Šķeltova road bridge. Totally we have covered 18,1 km. If there is a wish to stretch the legs it is possible to go to 1 km distant Peipiņi Catholic Church. In this case you have to go southwards the road. From the road there is a beautiful view on the just traversed lake Aksenova. From the church you also can see the lake Peipiņi. Peipiņi parish was established after the First World War and the first dean was Jānis Ziemelis. For a country parish relatively big corner-jointed chapel with two towers was built in 1926 at expenses of parishioners. In 1931 the dean Jāzeps Ļakse put a lead roof on Peipiņi, built the towers with a high spire and covered with lead. In 1935 the church was planked and painted. From 1955 to 1972 the dean D. Punculis took out the beams and immured bricks instead, iron fence was put around the church and gates in concrete posts. In 1955 the dean Staņislavs Svilāns built a parsonage behind the church opposite the presbytery. The church was called the Church of Virgin Mary – Mother of Pains. In 2002 Peipiņi Church was included in project of list of national protected cultural monuments. Art objects are located in the church that in 2001 were included in the project of lists of protected monuments – church ceiling lantern, sconces, and reliquary. Behind the bridge after 1,2 km we arrive at Upes Kudiņu water mill, there is a facilitated resting and tent place. Staying must be agreed by phone 29734566. Here is no dike and the tour can be continued without carrying of boats. 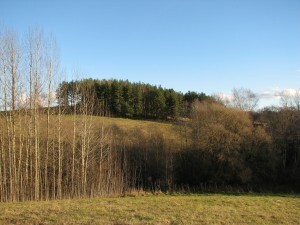 On the right side there are houses and right there in the wood there is Brīver castle mound. In 1941 the castle mound was discovered and wider described by A. Gusars. Timbered Brīveri castle mound is established on ca. 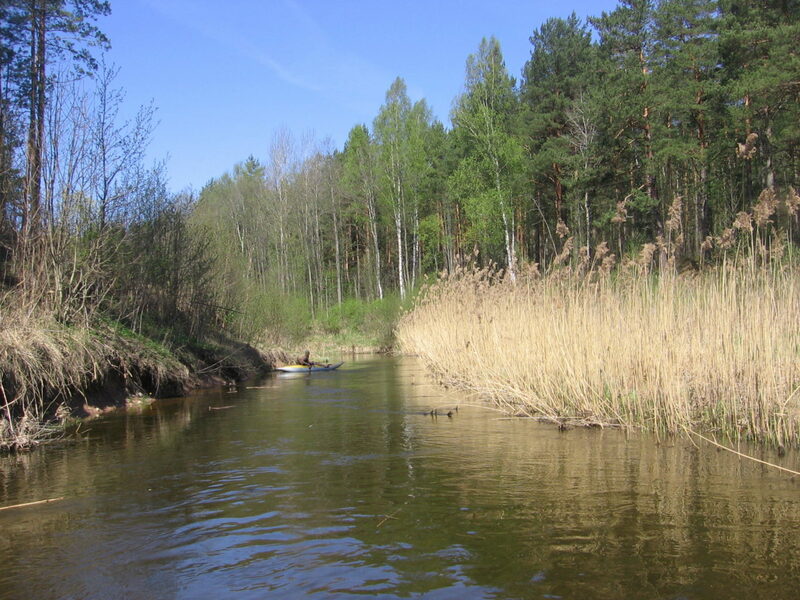 15 m high left bank of the river Dubna, where forming 8 m deep glen a brooklet flows into the river. Thus a land corner has formed that in north, east and south-east has the sheer brook glen descent, but in south and south-west the sheer riverside of Dubna. On north-west where there are no natural obstacles the castle mound is delimited from surroundings with a 45 m long, 5 m wide and 1 m high dam. In front of the dam at the descent of glen possibly remains of the second ditch are to be observed –the ditch itself in the front of the castle mound is ploughed up. Inside of the dam there is 8 m wide and 0,5 m deep ditch delimitating a flat area of 35×40 m. On the side of the plateau against the ditch once there was a soft 0,2-0,3 m high bank that nowadays cannot be seen anymore. More than 0,4 m thick cultural layer was found in the plateau of the castle mound that has formed in the soil of light sand. Chippings of handmade smooth plates were found there that could testify that the castle mound is to be referable to I millenary A.D. Behind the Upes Kudiņu mills having covered 3 km we reach the next bridge. This time it is Aglona-Šķeltova road bridge. From the beginning of the route we have made 22,35 km. 1,3 km after the road we reach Staškeviči HPP reservoir, after another 0,5 km on the left side there is the place where Dubna bight branches. This bight is dug over and the river bed is straightened out. In the middle of the straightened span there is Staškeviči HPP dike. Till the dike there are another 250 m, but also behind the dike the straightened span continues for another 250 m. In this point from the left side the natural bed of Dubna joins again. More extreme tourists can try to bypass the HPP by the old bed, but you have to count that the water level here is lower than in the straightened span. This bight of Dubna is 3 km long and we don’t count it in the total length of the route. After this juncture further 7,0 km Dubna flows through the biggest wood area and the least populated span in whole route. There are also no somewhat remarkable roads in this span. Part of this span Dubna is boundary river between Aglona and Daugavpils counties. After these 7,0 km we have arrived at a small wooden bridge. After a longer period on both riversides we can see houses. Ca. 50 m after the bridge we reach a bight where part of the river flows again straight, but part on the left and makes a bight that after 520 m joins again with the straight span. The straight span is 150 m long. From this juncture having covered ca. 0.5 km there is Ļāperi castle mound on the left bank in the wood. The first person who investigated and described Ļāperi castle mound was Ernests Brastiņš, the famous ancient times investigator of the first Latvia. He was the first person who starting from 1922 every summer visited and investigated the castle mounds of Latvia, as a result of what he published four books about the castle mounds of Latvia. Every book was devoted to one region of Latvia and to the castle mounds investigated in this region. Book about the castle mounds of Latgale was published in 1928. Here is also the description about Ļāperi castle mound, and also about further Greita hill and Baranovska castle mound. Ļāperu castle mound is a solitary round hill that rises 28 m above the level of Dubna. The hill has a small slightly explicit round plateau with diameter of ca. 35 m. Two meters lower than the edge of the plateau all around the hill at places you can see a terrace. Another terrace is located some meters lower than the firs one. Both these terraces are weekly remained because in former times the hill was ploughed. The soil of castle mound consists of fine-grained sand where a coniferous forest grows that has already taken over the entire castle mound. Several stories go about the Ļāperi castle mound. One of them is about a virgin who has lived in the hill. She was imprisoned there and she wanted to get away from the hill. Once she came out and asked the people for beads, so she shall become free again. The beads must be particular-they have to be two and equal. If the virgin would receive such beads, she would get out of the castle mound. Such beads weren’t found and the virgin had to stay in the castle mound. It is said that she still lives there. Another story goes that a nobleman had lived inside the hill who guarded his property there. Once during the war he had taken his possessions and put in the carriage and gone away. The carriage was set to two black horses. The horses had dragged the nobleman with all hid possession in the lake at the foot of the hill. It is said that the lake is now overgrown. When continuing the route after 2.2 km we reach Šķīvišķi HPP reservoir. Having gone ca. 1,5 km by the reservoir we arrive at the next castle mound –Greita hill. The origin of the name “Greita hill” is explained differently. One of the versions is that the name has originated from a fabulous enormous virgin Grieta who was buried in the hill fill; another version is that “Greida” is the same as bank, fill, Russian “grjada”. According to the opinion of Ernests Brastiņ’s this explanation seems acceptable because the castle mound really is characterized by ca. 70 m long straight fill. Dubna encloses the 30 m high castle mound from three sides. A wide ditch was made at the side not protected from the river from the bottom of that to the hill there are 9-10 m. At the moment the castle mound is overgrown with wood. About the Greita hill there goes also a story. Once in the evening village people have seen that a gate was opened in the castle mound. Bright light have shone in the gates. Slim woman had stood in the light and next to her black dogs. After a moment the gate had closed again and the brightness had disappeared. After another 0,9 km we arrive at HPP dike. Šķīvišķi HPP was built in 2001. It is the upper HPP of cascade, underneath there is Dubeņeca HPP, behind it-Galvāni HPP. HPP complex consists of massive ferroconcrete foundation, on that there is turbine chamber erected from metal constructions and generator room with flat-belt drive and above them container-type structure with electric accessories equipment. This and also the other two hydroelectric power stations are managed by SIA Novators. Totally in the route we have covered 37,0 km. 0.6 km behind the Šķīvišķi HPP begins Dubeņeca HPP reservoir and after another 0.74 km we reach HPP dike. Dubeņeca HPP is the second one in this cascade, but the first one who was built in 2000. 0.47 km behind Dubeņeca HPP dike begins the third and the last HPP reservoir. This is Galvāni HPP that was built in a new place in 2001 and is with the least power. If the power of both previous HPPs is 450-500 kW for each, then the power of Galvāni HPP is half as big -250 kW. In summers there have been cases when a completely small rivulet flows behind the dike of this HPP that can encumber further movement of water tourists. If you’re lucky to arrive at the HPP at midday, there is hope that the sluice shall be opened and the water level shall be sufficient to continue normally the route. Usually opening of sluice is from 1-2 p.m. Opposite the dike on the right bank you can see Baranovska castle hill that is overgrown with wood, although in twentieth – thirties of the last century the hill wasn’t overgrown and it was agriculturally cultivated. Just as with the two previous castle hills, Ernests Brastiņš was the first person who investigated and described this castle mound. According to the looks, the castle mound is a solitary small hill with 7-10 m high step sides. It is located in the coomb of other hills and for an ignoramus it is difficult to see and distinguish among other ambient hills. Sides of the hill already naturally have been steep enough so additional fills and other work isn’t done. Since the castle mound was ploughed for ages then the occupation layer is badly preserved. Length of plateau is ca. 50 m, but the width is half as long. Perhaps the castle mound was populated already during the Stone Age. A story goes that golden money is buried in the castle hill and it is possible to dig the money only at Midsummer night. In former time there was no Midsummer night when local people wouldn’t have searched for this buried golden money. Behind Galvāna HPP dike after short 0.5 km we reach Ambeļi-Aglona road bridge. When going along the road southwards after short kilometre it is possible to get to Ambeļi. In Ambeļi you can see the small Catholic Church that was built in 1888 and Ambeļi park. Area of the park is 6,2 ha, its arrangement was begun at the end of 18th century, later it was restored according to the project of G. Kūfalts. It is a beautiful landscape park between two hillocks, in the valley there is a pond with Love island. 38 exotic plant species grow in the park. When returning at Dubna we continue the route. Behind the bridge after 2.7 km we reach the lake Višķi. Totally in the route we have covered 42.5 km. When arriving at the lake Višķi we finally don’t have to worry about fallen trees and other obstacles. The lake Višķi is located 99,3 m above sea level. Its area is 3,60 km2. Length – 2,6 km, maximum width 1,9 km, just a narrow road belt separates from the lake Lukna. Still in the fiftieth of the 20th century the lake Višķi was connected with the lake Dodka that now is separated one from another by a marshy constriction. Banks of the lake Višķi are flat or low, in places steep. The coastline is indented by several peninsulas thus forming a convoluted three-inlet reservoir that grows narrow at the north-east end. Višķi castle mound can be visited on the peninsula at the north-east end. Here is also good bathing ground and overnight stay place. Further there is the guest house “Višķezers” at the very north end of the lake where you can comfortably stay overnight and if necessary agree on leaving the car. Having arrived in the lake we move westward against the closes bank that is the largest peninsula of the lake. Further we continue the way along the peninsula till we see the bridge over Dubna on Višķi-Aglona motorway. This span of Dubna connects the lakes Višķi and Lukna. If you don’t want to continue the route here is a convenient place where to land and end the tour. Tour over the lake is 2 km long. Till the bridge totally we have covered 44.5 km. When entering the lake Lukna we keep at right and go to the 450 m distant resting-place at the south-east end of the lake. It is not advisable to plan to stay overnight here because at weekends in good weather loud companies usually arrive here. However, it is advisable to stop here and climb onto the bird observation tower. From there you can see wonderful views – the majestic Višķi Catholic Church, the lake Višķi, lakes Boltari and Ostrova at the foot and of course the Lake Lukna with its creeks and ambient hillocks. Here also you can end the planned tour because it is convenient to land here and drive up with the transport is also no problem. Area of the lake Lukna is bigger that of the lake Višķ and makes 4.09 km2. Maximum length reaches 5.3 km, width in north-west part-1.6 km. Average depth of the lake is 2.4 m, but maximum depth 6.1 m.
Banks of the lake Lukna are flat. East bank is firm, but other banks are miry, overgrown with shrubs. The lake is rich with creeks. North-west part is wider, in the middle there is contraction, East part is wider again, but not as wide as the north-west part. The middle contraction is also the deepest place of the lake. Coastline is 18.5 km long. Further we continue the route by the lake Lukna westward. The left bank of the lake Lukna is densely populated. Višķi, Višķi technical college and Špoģi are located here. Višķi Catholic Church built from the split boulders looks wonderful from the lake. On the right bank we can notice Daniševska old-believers preaching house and Maskovskaja Orthodox church that are close by one another. Having gone ca. 4 km by the lake Lukna we arrive at the contraction of Dubna source. After another 1.6 km we arrive at Daugavpils-Rēzekne motorway bridge. Here end the first part of our tour. We have arrived at Špoģi village that is the centre of Višķi parish with parish administrative building, schools and stores. Not far from the bridge you can visit Second World War warrior’s cemetery. Totally in the route we have covered 50.5 km. It is advisable to take this route in spring because then the water level is higher and the river is easier to pass. Frequently there are fallen trees in the route that can be overcome by pulling or carrying the boats. This roué is meant for tourists who are not afraid of certain difficulties and inconveniences, however unexpected adventures and adrenaline are guaranteed in this route, as well as satisfaction at the moment when you’ll have made the route. Later for year in other tours you shall remember and tell about the adventures of this tour.